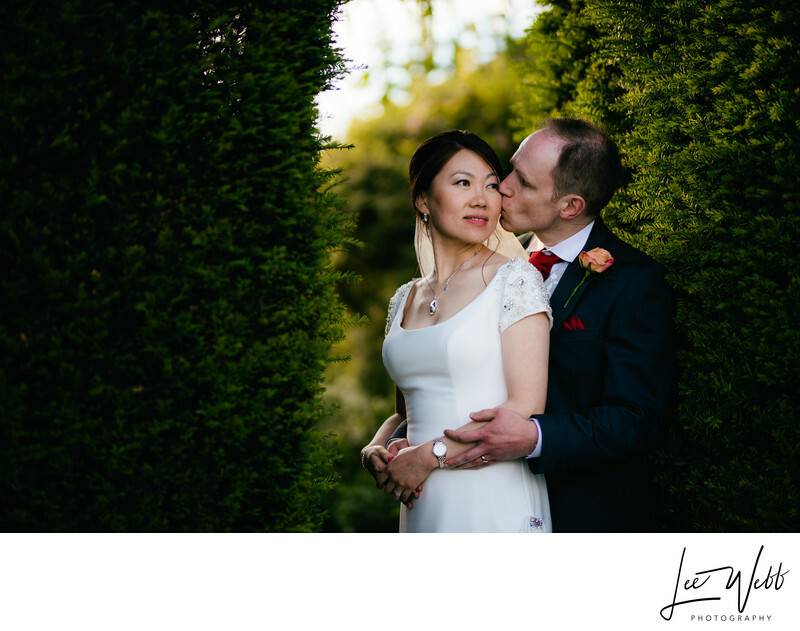 Peng and Ross got married, and hosted their wedding reception on their family farm in Worcestershire. Earlier in the day we had had a real mix of weather, from gale force winds leading to torrential rain and then finally bright, direct sunlight. Because we hadn't had the best conditions earlier in the day, I decided that I would re-visit the couple's photos after the wedding breakfast when the sun was lower in the sky, and the quality of light, for photography at least, was much better. As it turned out, the light was perfect right before the bride and groom were set to take their first dance as husband and wife. I mentioned that the light was ideal for some stunning wedding photography, and asked if they minded putting their first dance back by 20 minutes. They agreed that the dancing could wait, and so we set off into the garden to take some couple's portraits. In the grounds of the farm, separating off two lawned areas was this huge hedge that was perhaps 20 metres long and 4-5 metres tall. Through the middle of the hedge was a cutting that allowed people to pass though, which of course made the most perfect natural frame in which to stand the bride and groom. With the late spring sung setting behind them, the scene could not be better. I stood the couple where they'd look best in a photo, and told them to pretend that I wasn't there. Once I had taken the image you see above, I realised I could naturally frame the couple in the cutting once again, this time shooting through the gap, with the bride and groom positioned on the main lawn. The resulting image (the one at the very top of this article) is absolutely beautiful and instantly became on of my favourites. I love the shape of the hedge and how it looks almost heart-shaped at the top. I really like the colour of the hedge too, how it's so dark as to almost appear black. To create this image I used my Sigma 85mm lens and shot at it's widest aperture of f/1.4. 85mm has for decades been thought of as the ideal focal length for portraiture, and as such its one of my most used lenses. The wide aperture worked to blow the foreground and background completely out of focus, which has the effect of really drawing your eye to the couple - who should surely be the focal point of any wedding photo! The delicate nature of the light in these images and the soft tones, in my opinion, make them timeless.